I was recently informed of the new Soap and Glory venture into cosmetics via some fellow beauty queens here on blogger. I have always been a fan of S&G, their body products and bath ranges have allowed me many a clean bath and shower. I love the packaging, the quirky design and little comments they include on the boxes and tubes, and of course, I love how it's all pink! I was quite excited about the possibility of their make-up range purely because I had always been curious to try the concealer they always offered in Boots, along with their lip glosses and cupids bow pencil. 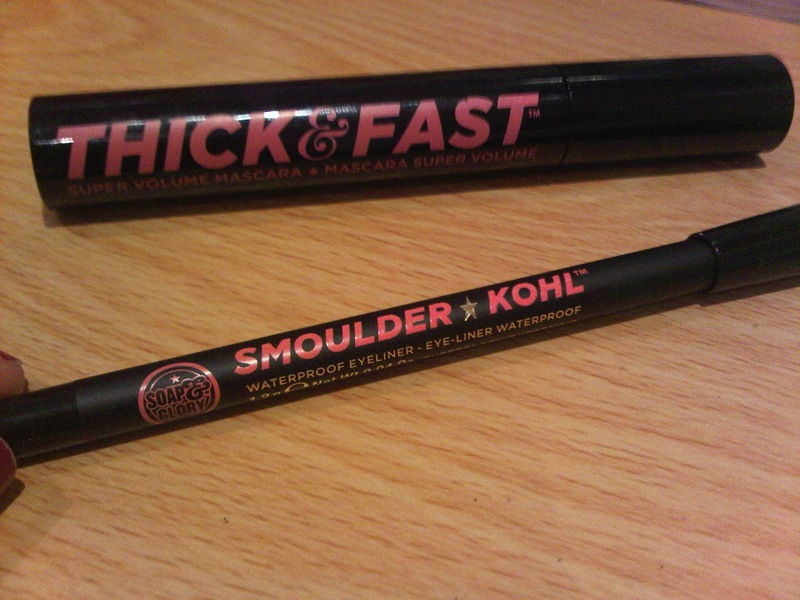 However I never actually picked any of these products up and now that the range is available exclusively in Boots stores, I thought I'd branch out and have a go with their mascara and eye pencil. The packaging of these two fabulous products are simple yet still retain the appeal of all of the other S&G items in their range we are so used to. There's a certain charm about the simple pink on black letting which tells you exactly what each product sets out to achieve. 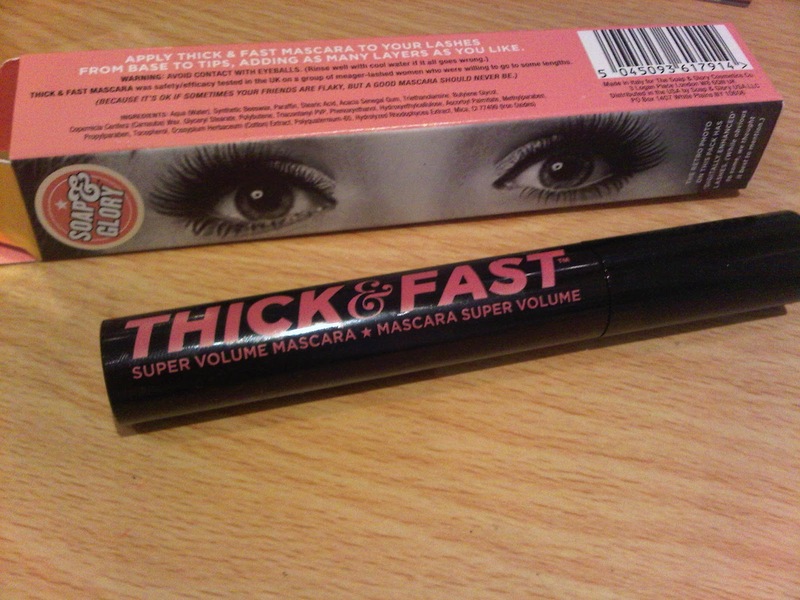 The mascara prides itself on being 'thick and fast', now to me this sounds like it wants to lather on thickly to the lashes when you apply fast movements of your hands to do so. 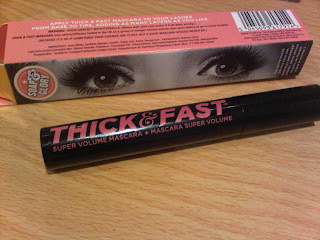 I really was hoping to get lashes like the lucky lady on the outer packaging (see left) but alas not. I do agree that it lengthens and makes your lashes thicker, but I guess my expectation of fan like lashes was just that, an expectation and not a reality. This definitely has something to do with the brush. Like all mascaras the shape, length and thickness of the brush is crucial in the application of the product and I have seen this type of brush before. I'm going to liken it to Benefit's Bad Gal, of which I own a mini version, and although that particular mascara may work well for some, I could never get on that well with the brush. The S&G brush is a similar story, it's 'fat', but does hold a lot of product and allows an easier application that Bad Gal. 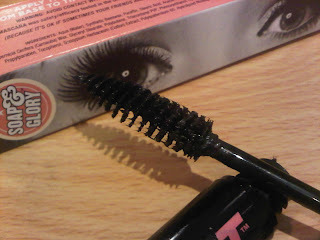 My only particular qualm is the fact that the mascara itself keeps getting all over the neck of the tube when I put the brush back in, is a wider the needed perhaps? Anyone else having this problem? I picked up my Soap and Glory mascara in Boots for £10 and while it's not been my favourite mascara to date, I do agree that it does like it says on the box, except for provide me with the slight false hope of a wide eyed fan like look. 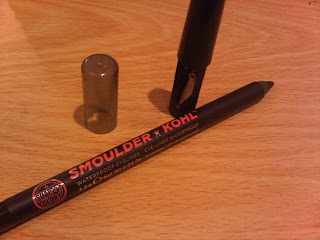 The other product I picked up is the S&G Smoulder Kohl eye pencil. I really like this pencil, it applies easily, smoothly and fluidly, it's a lovely rich black colour with the added bonus of being waterproof, which it definitely is as I ended up with watery eyes from the wind today and it didn't budge for me! Another significant plus point is the built in sharpener in the lid, very handy for those times when you can't find your pencil sharpener in your make-up bag, simply pop off the cap keeping dust and whatnot out of the sharpener and voila, there you have a nice sharp pencil. I picked up my Soap and Glory pencil for £5 in Boots and it's definitely beaten my Topshop Kohl eye pencil to the top spot for usage in my make-up bag. Have you seen the Soap and Glory cosmetics range yet? What do you think? Take a peek here.